Do you know which region gave the Bhel-puri, Pani-puri, Pav-Bhaji and Vada-pav to the nation? Oh, yes, this very state. Can you imagine at least one weekend without munching on these delicious snacks? I cannot! is divided into Konkani cuisine and Varadi cuisine. Konkani cuisine is popular along the coastal regions and the Varadi cuisine is along the more interior Vidarbha region.
. Firstly, tamarind pulp or tamarind juice is used less and instead kokum juice is used. Kokum is a deep purple berry which has a pleasing sweet and sour taste. It is commonly used in a digestive appetizer called the sol kadhi. Gravies and sambar are also flavored with kokum juice. Yet another unique flavor of the curries is an exotic masala called goda (sweet) masala or kaala (black) masala. This gives Maharashtran cuisine its very own authentic flavor. This basically is a combination of onion, garlic, ginger, red chili powder, green chilies, mustard and a few other spices. We have printed out a recipe here. Yet another predominant feature is that Peanut oil is used as the cooking medium. In this region, the vegetables are most often steamed rather than fried because they feel oil should not be seen in the cooked food. So minimum or no oil is used if it can be avoided. Oh yes, highly nutritious! A specialty of the Maharashtran cuisine is that even though there are basically two wide categories of cuisine viz Konkani cuisine and Varadi cuisine, still a very pronounced differentiation of preparation can be seen in the delectable of Mumbai, Konkan, South Maharashtra, Vidarbha, Pune, Solapur, Aurangabad, Nagpur, Kolhapur and Jalgoan. We do not have so many different varieties of food prepared in any other state. So, where shall we start? I hear ya, Mumbai it is! The commercial capital of the country! Bombil or Bombay duck is the most popular non-vegetarian dish and seafood specialty here. It is batter fried and crispy. 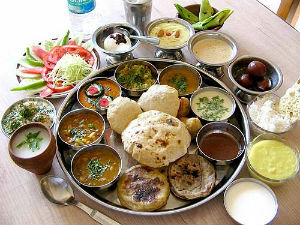 Maharashtran meals are served on a thali. Each food item served on the thali has a specific place. The thali comprises of Puran-poli, bhaaji (vegetable dish seasoned with Goda masala), chutney, koshimbir, papad, rice, varan (plain old boiled dal), Amti, Rassa and pickles. Rassa is a variation of the Bhaji. It is prepared with potatoes and cauliflower with tomatoes and/or fresh coconut scrapings and plenty of water to produce a more fluid consistency than regular bhaji. Amti is another variant of the curry, with some lentil (toor dal) and flavored with goda masala, tamarind, jaggery and coconut. Koshimbir, a very healthy salad is made from raw veggies mixed with yogurt and ground roasted peanuts. Chapati made from wheat flour is more common in urban areas and Bhakri made of millets like jowar and bajra, form part of daily food in rural areas. The Mughols influence has a wide variety of non-vegetarian dishes which mainly use chicken, mutton, fish and seafood. The Kolhapuri taambda rassa (red curry) and pandhra rassa (white curry) of chicken and mutton from the southern city of Kolhapur and the varhadi rassa from the Vidarbha region are popular. Seafood delicacies are a part of the Konkan region. The most common sweet of this region is Puran poli. A small variation of this called Gulachi poli is also a delicacy is many Brahmin households. Modak, the steamed sweet is a rage during the Ganesha festival. Karanji also called kanola is commonly prepared during Diwali. Gulab Jamun, vermicelli kheer, and ansara are also popular sweets. Ansara takes almost 3 days to prepare, but it’s worth the tedious process. Jilebi, Basundi, Aamras (mango sweetened with sugar and mixed with condensed milk), Shrikhand, Shikran(sweet made of banana, milk and sugar), Narali Bhaat(sweetened rice mixed with coconuts and cardamom), Bombay Halwa, Bombay Ice Halwa and Ladoo are all most popular and consumed everyday as desserts. Vada-pav, Pav-Bhaji, Poha, Chivda (spiced flattened rice), Upma, Misal Pav(Kolhapuri preparation), Matar-usal-pav, Thalipeeth(spicy pancake eaten with yogurt), Sabudana Khichadi, Bhadang(spicy puffed rice), Shira(semolina pudding), Chana daliche, sabudana vada, methi vada, Chili bhajji, Bombay Sandwich are common snacks and a few of these have entered the five star restaurants and gained international popularity. This region has a specialized preparation of pickle. They pickle mango, lemon, goose berry, mustard, fresh turmeric, Chilies and Papad. The spice they add to the pickle is unique and gives it an authentic Maharashtran tang. regard their food as ‘Anna he poornabrahma’ which means food is equal to God. They worship food. Maharashtrans also believe in offering their food first to the lord as a thanksgiving ritual for all that he has given like most regions. But they are unique in this because they give a lot of importance to it and stick to it. Indeed a heavenly cuisine needs to be offered to the heavens first. Feel free to comment or share your thoughts on this "Maharashtrian Cuisine" article from Awesome Cuisine.